Plan your getaway to one of downtown Atlanta's most iconic landmarks. Rising high above the heart of the city, The Westin Peachtree Plaza, Atlanta features world-class service, superb amenities and an unparalleled location, just moments away from Atlanta's best-known attractions, including the Georgia Aquarium, World of Coca-Cola, State Farm Arena, Centennial Olympic Park and the Mercedes-Benz Stadium. Relax in our hotel's four-star accommodations, which offer views of downtown from floor-to-ceiling windows, the Westin Heavenly Bed and gracious touches. Take in the renowned views from The Sun Dial Restaurant and Bar, 73 stories above the city. Challenge yourself in the Westin Workout Fitness Studio, followed by a dip in our indoor/outdoor pool. Plan impressive events in our hotel's 80,000 square feet of fluid meeting space or extend into the venues at AmericasMart and Southern Exchange, both directly connected to our hotel. 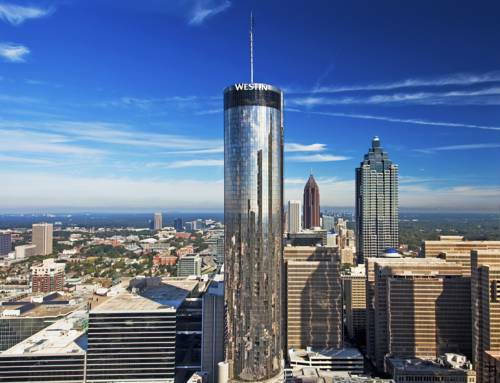 Discover the soul of the city from The Westin Peachtree Plaza, Atlanta. The Sun Dial Restaurant, Bar & View: Soak in the unrivaled 360 views of downtown Atlanta from our iconic 73rd floor restaurant and elegant bar. Savor our award-winning seasonal, contemporary American cuisine that makes the most of the city s proximity to local, farm-to-table ingredients. The Cafe: Kick off your busy day with a Southern-style buffet breakfast in our lobby restaurant. Choose from a vast variety of morning favorites, including eggs made to order, homemade cereals, fresh pastries, Belgian waffles and fruit, or order a la carte. The Sun Dial Bar: Toast to special moments in the beautiful setting of our sky-high bar with incredible views. Gather with colleagues to celebrate a successful venture over drinks and shareable small bites or meet family and friends to share a milestone. Bar 210: Catch up with family and friends after a busy day of touring Atlanta in our inviting hotel bar. Enjoy a light meal before heading out for the evening or meet for one last nightcap before heading to your relaxing room. Starbucks : Order your favorite coffee beverage and treats from our full-service Starbucks , located in the lobby of our downtown Atlanta hotel. Grab a coffee on your way to a meeting or pick up food to take along on your adventures.